Christmas for me is obviously not a day to celebrate yet more a time for me to catch up on some gaming time. 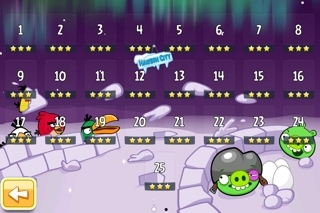 I do play along with the advent calender tradition in the form of Angry Birds seasons. Alas the regular challengers of Tim & Jochta did not complete his year but I did have some competition from my youngest son. All the levels three starred & 1-24 is a pain in the xmas tree !! I tried to play Angry Birds Star Wars but it just feels all the same so I will leave Angry Birds alone until next xmas.